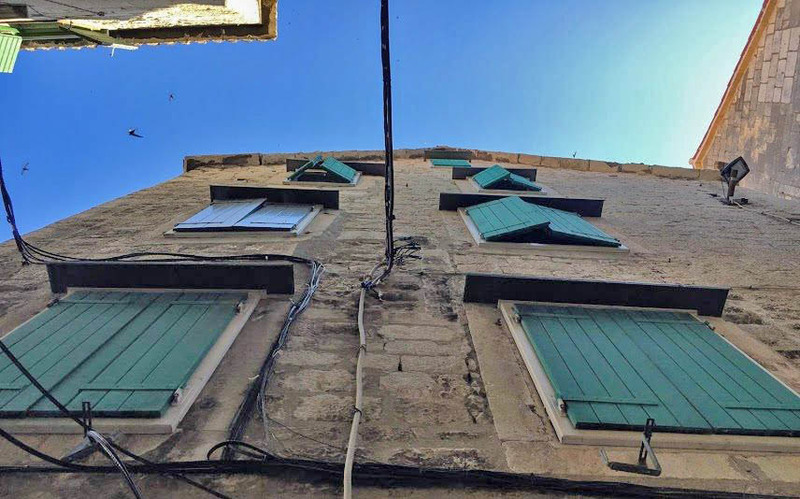 Garfield Realty » Croatia is Europe’s Best Kept Secret! 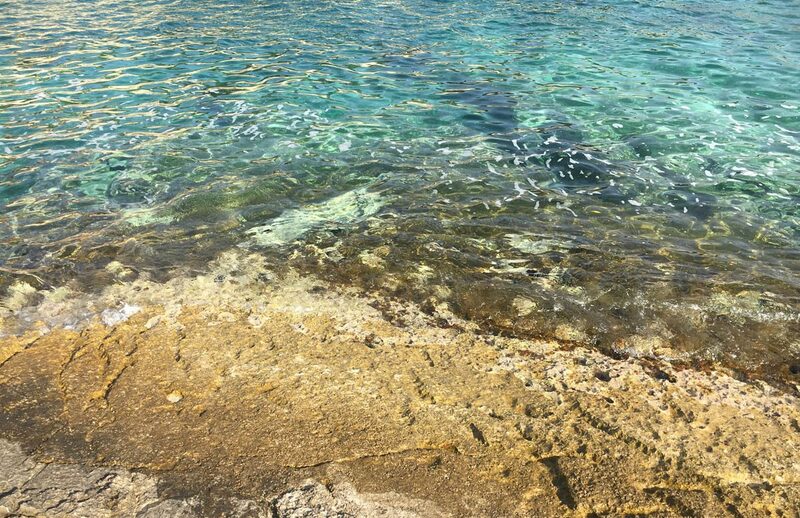 Spring and summer are the very best times to visit Croatia, when the crystal clear, aquamarine waters of the Adriatic are most inviting. Whether you’re seeking a respite from reality or a traveler’s paradise, below are some tips for enjoying your stay. You can catch Split’s coastal Mediterranean beauty on display in Game of Thrones. Split is Croatia’s second largest city and a beautiful mix of the old and new. Buzzing with energy but also relaxed in its coastal pace, this is a hotspot for culture, history, and breathtaking scenery. 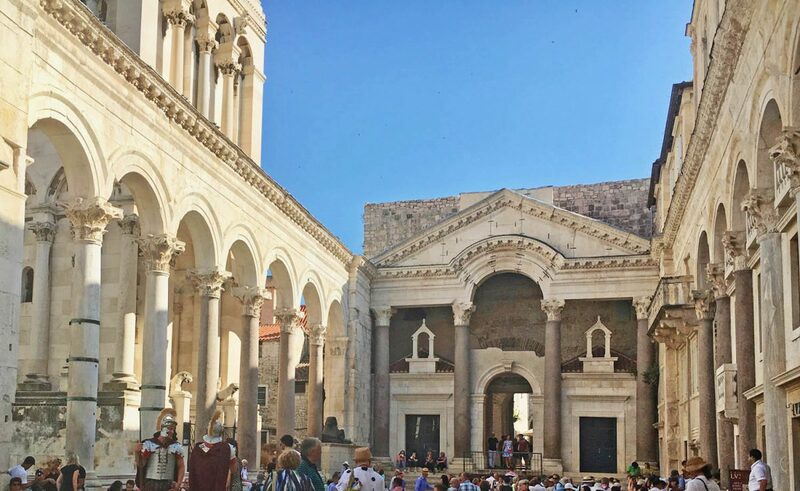 You can’t miss Diocletian’s Palace, a Unesco World Heritage site, and one of the world’s best-preserved monuments of the Roman era, which comprises about half the old town of Split. Built around the 4th century in 295 AD as a retirement villa for the Roman Emperor’s family and their 700 servants and guards, this ancient fortress is incredibly well preserved and now contains a multitude of shops, cafes, restaurants, and apartments along its narrow streets. There is no entrance fee for the palace itself, and it is open all hours of the day and night; most shops are open Monday to Friday 9am-1pm and 5-8pm, Saturdays 9am-1pm, and sometimes on Sundays. 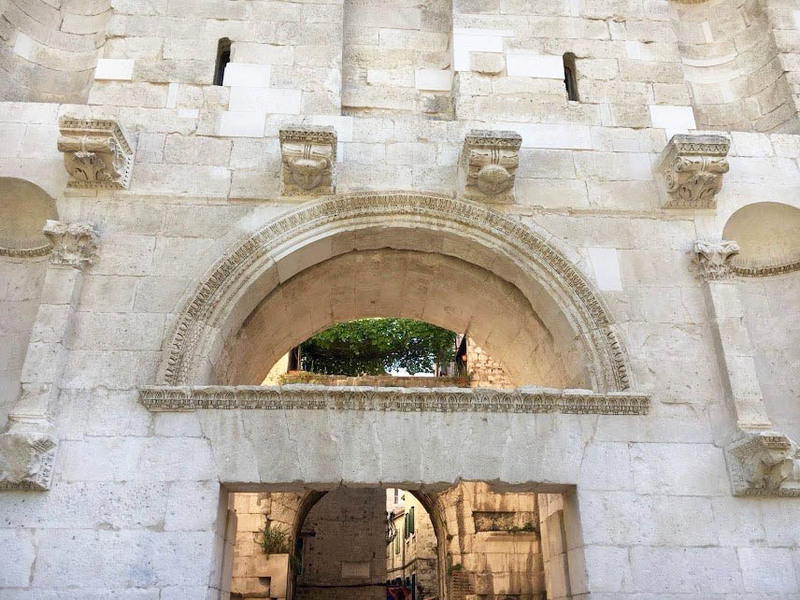 Some sites inside the palace require a ticket, such as the underground tour, Cathedral of Saint Domnius (where you can attend a Sunday Mass), Split’s Bell Tower (with 360 degree panoramic views of the city), and Temple of Jupiter. After a tour you can wander and explore the maze of side streets and boutiques or dance to live music in the center of the Peristyle (the palace’s courtyard). Just outside the northern wall of the palace is an enormous statue of Gregory of Nin, a Croatian bishop hailed as a hero. When Christianity was fading in popularity on the island in 926 AD, he defied the Vatican and held services in Croatian rather than Latin. This encouraged the uneducated and poorer populace to embrace Christianity; today, nearly 90% of Croatians are Catholic. Go ahead and rub the statue’s shiny big toe for good luck. The Riva is the main public hub of the city, where locals congregate and events take place. This wide, tree-lined esplanade is buzzing with energy in the late afternoon and throughout the evening. You’ll often hear the serenading sounds of locals singing klapa, traditional a capalla Adriatic tunes with soulful harmonies, sung in small groups. Partake in a Split Culinary Tour. An expert will meet you at the Peskarija fish market and Pazar green market in the center of Split to help you choose the best fresh fish and produce of the day. These charming open-air markets are open Monday through Saturday from 8am-2pm and Sundays 8am-11am. From there, you will head nearby to the Diocletian Wine House, where the chef will prepare a delicious multi-course meal for you from the food you’ve hand-selected. Tucked within the stone walls of Diocletian’s Palace is the exceptional and affordable Makarun Konoba and Bar. The ambiance is relaxed and romantic but family-friendly, the food is incredibly fresh and beautifully prepared, and the service is fantastic. If you are looking to try a classic Croatian specialty, head to the family-run Konoba Fetivi, known for serving the best black cuttlefish risotto on the island. Be sure to also save room for their apple strudel, made from an old family recipe. Within a scenic hour-long drive from Split is a day-tripper’s paradise, Krka National Park. Fully immerse yourself in nature by hiking along the many miles of walking paths overlooking 12 stunning waterfalls, and jump into the water whenever the mood strikes. You can even swim in front of the largest waterfall in Krka, Skradinski Buk. This park is much easier for families to navigate than the larger Plitvice Lakes. If you prefer to take a bus from Split, head to Skradin (the town Bill Gates visits every summer), stroll 5 minutes down the road to the visitor’s center to buy your entry ticket, and board the boat headed down the Ria River through Krka Valley directly into the park. Roughly 2-1/2 hours from Split by car, Plitvice Lakes is a wondrous and expansive series of 16 interconnected lakes with ample hiking and gorgeous vistas. You can book a day tour or arrange an extended stay. Be aware that it will be quite crowded in the summertime and difficult to explore with small children due to narrow tracks and trails. You are not allowed to swim at Plitvice, but you can enjoy the sights and capture breathtaking pictures of its stunning natural beauty. To journey from Split to Vis, take a breezy 2-1/2 hour ferry ride. Head to the top deck of the Jadrolinija with a good book to soak up some sun and enjoy the views along the way. 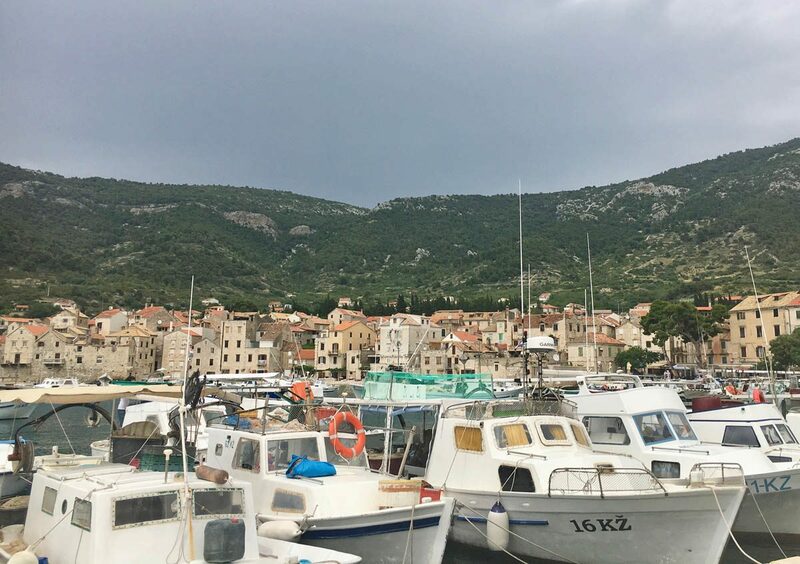 When you arrive in the port of Vis, purchase a cheap pair of water shoes to protect your feet on the white stone beaches from sea urchins nestled inside the rocks. With a population of around 2,000 residents, Vis is known as the gastronomic capital of the Adriatic. Visiting Vis is like stepping back in time, where you are forced to recalibrate to a more mellow, relaxed pace. Until Croatia gained its independence in 1991, the entire island was forbidden to tourists; it was annexed as a closed military base completely isolated from the outside world. 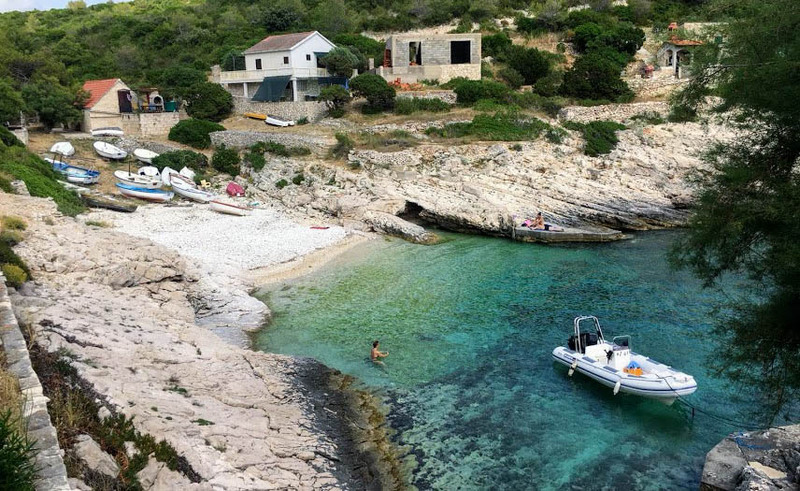 When the Yugoslavian army abandoned Vis virtually overnight in 1992, regular life and tourism slowly returned to this gorgeous, sleepy, and under-developed island. Beyond the pristine white stone beaches and waterfront vistas this island is known for the simple daily delight of observing butterflies dance around wild lavender bushes. We highly recommend putting local driver Toni Vitaljic on speed dial. He can take you anywhere you need to go, and will arrive on time, every time: vitaljictoni@yahoo.com/ tel +385-98-777-314. Toni grew up in Komiza and lives in Vis, where he seems to know everyone on the island. He became our defacto tour guide. A trip to Stiniva Beach is a must. This small and pristine white stone beach was named one of the top beaches in Europe. It has been speculated that it was once a cave that collapsed forming this secluded cove. 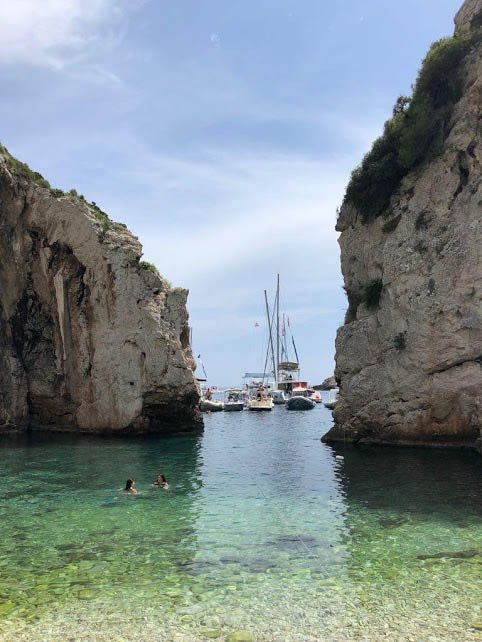 With proper shoes, you can hike a rugged path down from Plisko Polje, or hire a boat to take you from Srebnra Beach to Stiniva (Toni can connect you to a speedboat driver). Tavern Peruka offers refreshments and snacks on the beach. Stiniva tends to be more populated than other area beaches, but is definitely worth the trip. Srebrna Beach was a short hike from our retreat center, Estate Under the Paintbrush, and might have been my favorite of all the beaches we visited. Because we were virtually the only ones there on a daily basis, it felt like our own private paradise. You can sit and meditate on the flat rocks nearby at Bili Bok (be aware this is a pro-nudist spot), soak up the sun, and jump into the purest waters to cool off. Another favorite is Teplus Beach. After a swim at Teplus, take a short walk from the shore to Restoran Dalmatino for a plate of grilled sardines, Dalmatinska garnitura (a common local side dish of swiss chard with potatoes), and delicious French fries. Head to the Blue Cave in Bisevo, a lovely, albeit touristy destination. Arrive between 11am-12noon, directly when the sun hits its peak and creates the natural phenomenon at the mouth of the Blue Grotto, Modra Spilja. Afterwards, take a boat to the sandy shores of Porat Beach. Enjoy a fresh seafood lunch at Restoran Kod Jaske directly on the beach, followed by a natural hike around Bisevo and a relaxing day by the water. Vis is known for it’s dry white Vugava and red Plavac Mali wines, produced from Dalmatian grapes grown on the island’s fertile soil. Antonio Lipanovic is a former cricket player and current crusader of Vis’s wine and local winemakers. His winery is housed in a cave at the hub of a network of military tunnels that were forged by Tito’s army after 1945. If you can’t get an appointment to taste wine onsite, it’s worth looking out for the Liponavic label at many local restaurants. Climb or take a drive up Mount Hum and head to the highest point in Vis for breathtaking panoramic views over the town. While you’re there, step inside the charming Chapel of Saint Duh – it’s simple, but worth a peek. Tito and his supporters famously took refuge along the southern slopes of Mount Hum during WWII. Though no longer signposted, Tito’s Cave can be identified by the large parking bay under a stone wall to the right of the road as you’re heading up. Another path from the summit of Mount Hum leads to the former rocket base. Stop to smell the lavender and enjoy a simple glass of wine at the charming Aeorodrom Gostionica Wine House. Call Konoba Golub in advance to order a traditional Croatian meal of Ispod Peke, a stew containing fish, lamb or octopus that is slow-cooked for hours over hot coals in a peka, a long-handled pan with a domed lid. We enjoyed scorpion fish that our waiter caught with his bare hands during a deep dive that morning. The views from the outdoor terrace overlooking Vis are a treat, and you can sip various flavors of homemade grappa from the back room as an aperitif after your meal. If the mood for pizza strikes, head to Karijola. With the freshest of ingredients served on a terrace overlooking the sea, the traditional pizza experience is naturally elevated. Stop by the wine shop near Caffe Bar Bejbi to book a dinner reservation at Roki’s for a top-notch meal served on an operating vineyard nestled between cricket grounds and olive groves. Roki also serves its own tasty Plvac and Vugava wines. 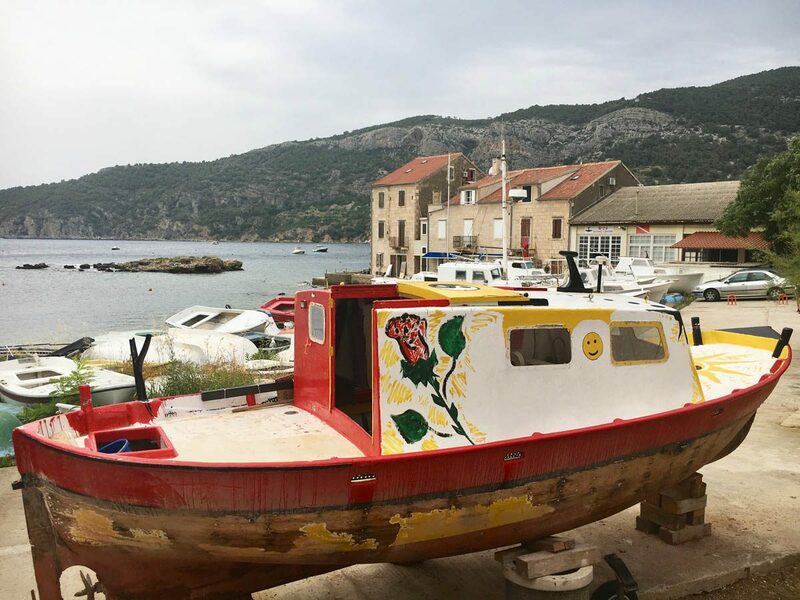 Roughly a 20-minute drive from Vis, Komiza is a beautiful coastal village and a popular destination among Croats. This small town offers a quaint bohemian atmosphere with seaside shops and restaurants. Enjoy a leisurely lunch along the water at any number of restaurants – you truly can’t go wrong. All the food is freshly prepared and most restaurants offer shaded waterfront views. If you are craving lobster, Konoba Jastozera is a premier destination. Bako is another local favorite offering a beautiful seaside setting and relaxed ambiance with flavorful food. The restaurant’s founder dove for decades in the surrounding waters and discovered some ancient Greek and Roman artifacts, which you can see on display. Do not miss a stop at Slasticarnica Cukar for dessert. The US dollar will take you far in Croatia. The current exchange rate is roughly 6 Croatian Kuna per USD. Croatia is often listed as one of the top 20 safest countries in the world (for reference, the US is currently ranked 84th). Doors are left unlocked in Vis, and we felt safe wherever we went at any time of day. People throughout Croatia are neighborly, welcoming, and respectful. English is spoken wherever you go, but they do appreciate if you learn some common words and phrases in Croatian. Be prepared to shake off your New York edge and embrace the ‘pomalo’ Dalmatian lifestyle, where a leisurely pace and enjoying life in the moment will become your top priority. We want to thank our fellow real estate agent, yoga teacher, and dear friend, Miya Signor, for introducing us to Croatia and creating an amazing annual yoga retreat. For anyone looking for an expansive and immersive adventure, book any of Miya’s future retreats and check out her weekly classes at Area Yoga in Brooklyn. Until next time, sigurna putovanja (safe travels)!